How often do large aircraft go missing over the past 50 years? Once every fifty (52) years! Exactly 2712 weeks before the aircraft registered 9M-MRO took off from Kuala Lumpur for the very last time as we know it, a Lockheed L-1049 Constellation registered N6921C flying for Flying Tiger Lines took off from Andersen Air Force Base in Guam towards Clark Air Force Base in the Philippines and was never seen again. With the aircraft, 96 passengers and 11 crew are missing and assumed dead. Until flight MH370, this was the last time an aircraft with more than 100 people on-board went missing. While the passengers are all military personnel, the aircraft was a civilian aircraft flying under civilian air safety regulations. Flight 739 originated in Travis Air Force base in California, destined for Saigon, then the capital of South Vietnam. The flight was to stop at Honolulu, Wake Island, Andersen Air Force Base (Guam) and Clark Air Force Base (Philippines). 107 people were on board, consisting of 11 crew members, and 86 passengers (83 American, 3 South Vietnamese). The aircraft took off at 1257UTC and was expected to arrive at Clark at 1916UTC. It carried 9 hours worth of fuel for the 8 hour flight. 8 minutes after take off, the flight sent a position report 280 miles west of Guam at 1422UTC on 16 March 1962, and expected to make the next call at 1530UTC. Guam Flight Service Station had communications problem until 1539UTC, when they tried to contact the aircraft to no avail. The disappearance prompted the US military to launch one of its biggest search and rescue operation in history. After 8 days, the search was called off after covering 520,000 km². This was the first ever case of an aircraft carrying more than 100 persons onboard disappeared and was never found. A tanker reported seeing bright lights in the sky around the vicinity of the aircraft’s expected position 90 minutes from the last contact, followed by two red lights falling into the sea, but the ship searched the area for 6 hours afterwards and found nothing. 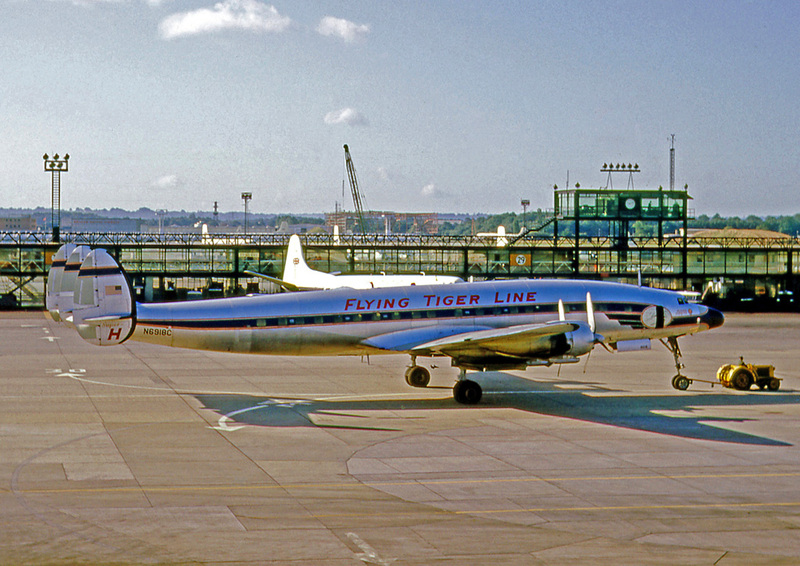 Accident investigation conducted by the Civil Aeronautics Board (before the days of the NTSB) concluded that the tanker crew may have seen the aircraft explode, and Flying Tigers supported the idea as sabotage was suspected. Despite the testimony by the tanker crew, no pieces from the aircraft were ever found that the accident was closed without a probable cause. A summation of all relevant factors tends to indicate that the aircraft was destroyed in flight. However, due to the lack of any substantiating evidence the Board is unable to state with any degree of certainty the exact fate of N6921C. Failure to conclude the case spurred many speculations. While the crew of the tanker were sure that they saw N6921C, they were confident that they witnessed a failed military operation and that the plane was shot down. Their suspicions hardened by nobody at the naval dispatch centers nearby accepted their calls. Other theories included poor security at airports in US overseas territories, making it possible that aircraft can be left unguarded for sometime, opening the possibility of sabotage. Isn’t this similar to the “shot-down near Diego Garcia” theory? This one is similar to the “kidnapped and taken to Diego Garcia”, or the “taken to Baikonur then flown elsewhere” theory that Jeff Wise wrote in his blog and the New York Magazine, and that I built on in “What can we learn from conspiracy theories.” And the one below, yes, we had something similar to this one for MH370 as well. MH370 has created demands of better aircraft tracking be put in force. My main concerns on the safety front isn’t with airplanes going missing, but on how to find airplanes that went down over the sea or remote areas. I am always an advocate of better and cost effective systems, but as ICAO pushes for aircraft tracking, there are those who ask for large expensive (and less physically secure) systems so that it can be used for more than tracking, up to extent of streaming Flight Data Recorder contents when trouble is in sight. Let’s not forget that the streaming would be useless as soon as the aircraft goes inverted and no one would be interested in putting a satellite communications antenna on the belly of the aircraft. Cheaper systems are already out in the market that can be on as long as aircraft is moving and the essential power supply for the aircraft is on (DC system) with no need of cockpit or inflight accessable circuit breakers as the systems are very low powered. It’s 1 in 9 billion.